AT least a dozen people have been injured and a man is fighting for life after a serious multi-car crash in Melbourne, leaving evening commuters stuck in traffic. Ambulance officers are currently on the Sydney Rd and Western Ring Road scene, where it's believed up to 11 vehicles, including a truck, have collided. Victoria Police spokeswoman Lauren Kells said one man, aged in his 30s, is in a critical condition. 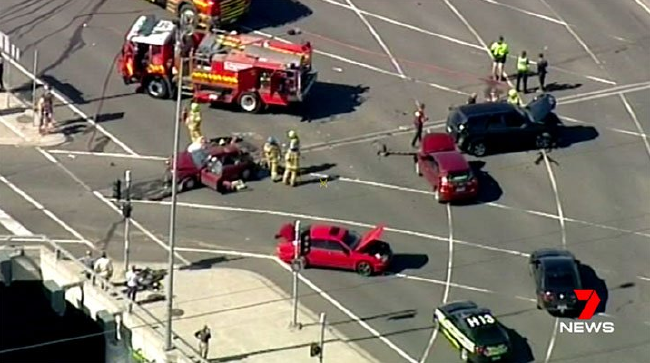 "It is believed that a truck has collided with several vehicles and a traffic light while exiting the Western Ring Road at Sydney Rd about 4.30pm," she said. "The male passenger of the first vehicle struck, believed to be in his 30s, has been transported to hospital with life-threatening injuries." Ambulance officers are attending to 13 people on the scene, including a primary school aged girl. The young girl has been transported to the Royal Children's Hospital and remains in a stable condition. Witness Charles Ayom said it was the "nastiest crash I've ever seen". Mr Ayom said the truck may have been speeding through to beat a red light. "It was speeding and running a red light, because the turn arrow was already red and it sped through anyway," he said. Mr Ayom said a cyclist was among those injured in the crash. More than a dozen people were treated on the scene. "The truck hit two cars from the side and pushed one all the way to the ramp entering into the Metropolitan ring Rd," he said. "And a cyclist was hit at the lights". "Multiple victims are being treated for non-life threatening injuries. The 30-year-old male truck driver is being taken to hospital with non-life threatening injuries," Ms Kells said. 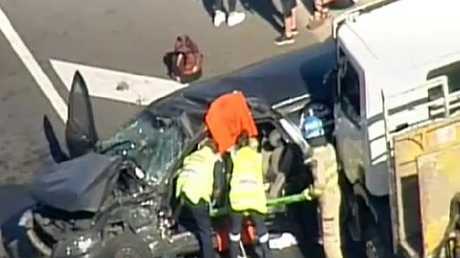 An Ambulance Victoria spokeswoman said five people in total have been transported to hospital. "A man aged in his 30s has been transported to the Austin Hospital and is currently in a stable condition. Another man in his 30s, also in a stable condition, has been to the Northern Hospital. Also, a man aged in his 50s has been taken to the Royal Melbourne Hospital in a stable condition." Fire crews rescued two people who were trapped in the wreckage. 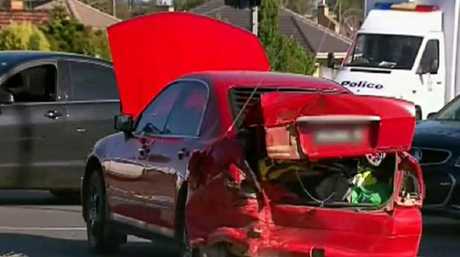 MFB crews rescued two people who were trapped inside two vehicles, and required "specialist rescue equipment" to conduct the rescue. A MFB spokeswoman said up to 18 firefighters were on the scene. A VicRoads spokesman said all outbound lanes on Sydney Rd are closed and urged drivers to avoid the area. "The entry ramp from Sydney Rd to the M80 Ring Rd heading towards Greensborough is closed." Emergency services remain on the scene. Meanwhile, Melbourne's train system has been thrown into chaos after a police incident on the Sandringham line this afternoon. Metro Trains confirmed the incident on Twitter. "Sandringham line: Buses to replace trains Elsternwick-Sandringham," the tweet said. It's understood the incident took place at Brighton station. Buses have been ordered to replace trains along the line, however it's expected to take over an hour for the services to arrive. Trains at Richmond have also been affected, with some trains ordered not to move as emergency services control the scene. Metro urged passengers to remain patient and not force their way out of trains. "Parliament - Richmond: To those passengers on trains in between Parliament and Richmond stations, please do not attempt to force the doors or exit the trains as it is incredibly unsafe," a Metro tweet said. Services from Flinders Street to Elsternwick have reopened.